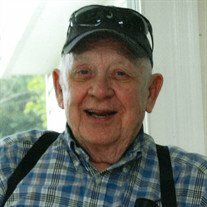 Charles Edwin Martin, 83, of Glen Burnie passed away peacefully on December 1, 2018. Charles was born to the late Olin and Grace Martin in Rose Hill, Va. Charles begin working at a young age to help provide for his family. He served his country faithfully and honorably in the United States Air Force from 1954-1958. He met the love of his life Shirley Lou in his hometown and they were married in February of 1958. Charles moved around pursuing work finally settling in Maryland. Charles retired from the State of Maryland as an engineer after many years of service. Charles was a faithful member of Lansdowne Worship Center for many years he and his wife raised their family in the church and he loved the Lord. Charles enjoyed keeping busy as a past member of the American Legion, the McDonalds morning coffee group, and walking at the Mall. Above all Charles enjoyed being with his family, he was a true family man. He was preceded in death by his parents; son, Randy Eldridge; 3 siblings. He leaves to cherish precious memories his loving wife, Shirley Martin; daughter, Darlene Wentworth (Ray); son, Ronald Eldridge (Jennifer); grandchildren, Amanda (Ryan), Kristy (David), Stacie, Tracie, Shirley, Maranda, and Charlie; 2 great-grandchildren; his brother, Willard Martin (Kathy); numerous nieces, nephews other relatives and friends. The family will receive visitors at the family owned Singleton Funeral & Cremation Services, P.A., 1 2nd Ave. SW (at Crain Highway) Glen Burnie on Wednesday, December 5th, from 3-5 & 7-9 PM. Services celebrating his life will be held on Thursday, December 6, 2018 at Lansdowne Worship Center 2130 Smith Ave, Baltimore, MD 21227 at 10:30 AM. Interment Maryland Veterans Cemetery in Crownsville. In lieu of flowers, donations may be made in his name to the American Heart Association.